Passion fruit is available year-round, with peak seasons being February to June and August to November. 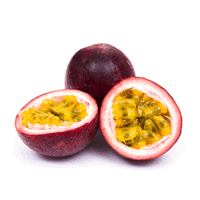 Passion fruit are high in fiber and Vitamin A. Store unripe passion fruit at room temperature until skin is wrinkly. Ripe passion fruit can be stored in refrigerator for up to 3 days. Choose passion fruit that are large and heavy for their size. If the skin is wrinkled, that means the passion fruit is ripe! Wash passion fruit and cut in half. Scoop out the jelly-like pulp to be eaten as is or used in juice, smoothies or dressings. Passion Fruit got its name from Spanish missionaries who saw the plant’s distinctly shaped flower as a symbol of Christ’s crucifixion. They carried the symbolic plant back to Europe and its popularity spread throughout the world.